Looks like Warren is up to his tricks again. This is one of my favorite strips. 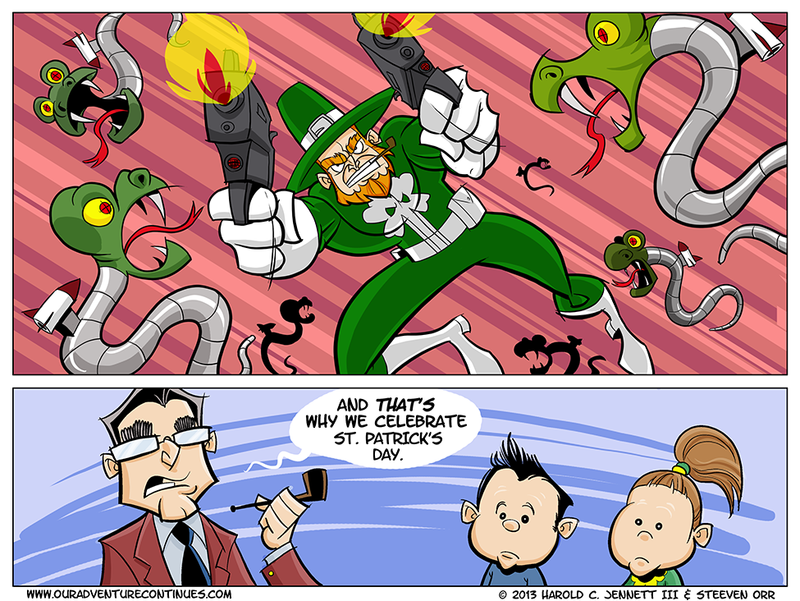 The script basically said that Saint Patrick is fighting cyborg snakes. The only direction I supplied regarding the look of Saint Patrick was that I thought it would be funny if he was wearing a costume that looked just like the Punisher, but green and white instead of black and white. When I got the line art to flat, I was blown away ... mainly because of the shamrock/skull on his chest. That's all Harold and I love it. Don't forget our Reader Roll call. If you are a regular reader of Our Adventure Continues, we want to hear from you. Email us at ouradventurecontinues@gmail.com, or comment here in the post. We've heard from one of you (Hiya, RD), and we'd love to hear from more. See you next week as we Get Down To Business. What if I'm an irregular reader? Awesome picture. Love the fact that they're not just cyber snakes - but rocket cyber snakes. Not sure why St Patrick is wearing a pilgrim hat instead of a bishop miter. But the clover insignia is genius. Aha, now I see - it's a leprechaun hat. My bad. Don't mind me. I like the 'And that's why...'-jokes. Thanks, these are some of my favorites as well.